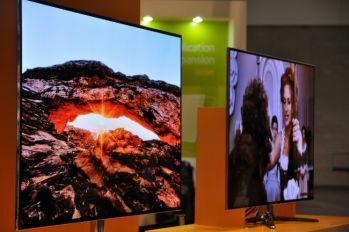 A year after two Samsung OLED TVs were lost in Germany during shipment to the IFA 2012 show, it is reported today that those two TVs were finally found in Germany. The two 55" flat OLED TVs were found in Germany and were not damaged (the paper boxes were ripped open though). Samsung asked the German police to continue its investigation due to the possibility of its link to a technology leak. It's been a while since we heard anything regarding Samsung and LG's OLED technology feud. The two Korean companies have been fighting over OLED (and other technologies) patents for a long time.The companies agreed to resolve their OLED dispute outside of the court of law and SDC's CEO even said the two companies are considering cross-licensing patents - but the OLED issues between the two Korean giants obviously isn't over and in April 2013 it was reported that the South Korean police searched the offices of Samsung Display as part of the investigation into alleged large-sized OLED TV technology theft from LG Display. Samsung and LG aren't the only companies involved with OLED espionage and alleged technology theft. In June 2012 it was reported that the Korean police is investigating a case of OLED technology leakage by Israel-based Orbotech's local Korean branch, where six employees are suspected of leaking AMOLED (WRGB)technology from LG Display and Samsung to several Chinese and Taiwanese companies. Later in 2012 we heard that AUO is suing two former executives that allegedly stole technologies (including AMOLED related ones) from the company and supplied it China Star Optoelectronics Technology (CSOT, a subsidiary of TCL).